Imagine this… you just went out for a long ride on your favorite trail, and you’re back home and it’s time to put your bikes away. How nice would it be to have a rack to roll your bikes into without the hassle of lifting them into the air like a bodybuilder? I know it sounds too good to be true, but you can have a bike rack like the professional bike stores. If you’ve got the space, one of these floor bike stands are the solution to your bike storage problems. 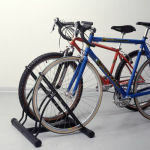 Rolling your bike into this floor bike rack is quick and simple – no more tripping over the bikes. No more dominoes when you knock one bike it falls on the next one. It is a well-designed bike stand made of sturdy steel members. Assembly is required and should take about 10-15 minutes. The front wheel of the bike rests securely in the front slot of the stand — no kick stand needed. If you are tired of your bikes collapsing on each others in the garage, this is a good investment. The quality build is exactly what you’d find at a professional bike shop! Simply roll your tire in between the steel bars, and voila – a simple, yet effective, way to store your bikes. This storage unit is constructed of tubular steel and has a robust epoxy finish to maximize durability. Depending on how you’d like the bike rack configured, you can can store them in the same direction or in opposite directions. To give you an idea of it size, when fully assembled, the product stands at 30″ x 24″ x 22″. It’s capable of stowing away bikes of all types and sizes, from road bikes to mountain bikes. I needed a place to park my bike so it didn’t keep falling on the floor. This stand is sturdy and easy to assemble which I really liked. My fat tire mountain bike fits perfect. Great buy. Who else is this bike rack good for? If you have kids, it’s great. For one its a safer and more secure solution. If you have smaller children, a vertical bike storage unit may be worrisome because they may pull the bike on top of themselves when trying to get it down. On the flip side, there’s no excuses why they can’t put their own bike away instead of leaving it in the front yard. This is an easy way for them to put their bike away without calling mom and dad in to hoist it up in the air. They can both pull the bike out on their own, and put it away on their own. I’ve tried several types of storage options for my rather large collection of bicycles and I have to say that these stands are by far the best solution for me. They are stable and hold nearly all of my bikes upright without putting undue stress on their wheels.